How to do a calculation in files operation using C? How to implement a usb-based transport for apache thrift? I've been using stack overflow for a long time now, and most of the problems a solution is already available. It is the first time that I actually couldn't figure it out with the web. I hope someone has the answer to the following problem. Introduction I am currently working on a project which should be capable of executing a command and act upon its response. This project runs on a debian based system in a c++ console application. In order to be able to perform such commands I tried using the LibUSB library. The problem Whenever packets are being sent it does not return a valid response as described in the documentation of the hardware. 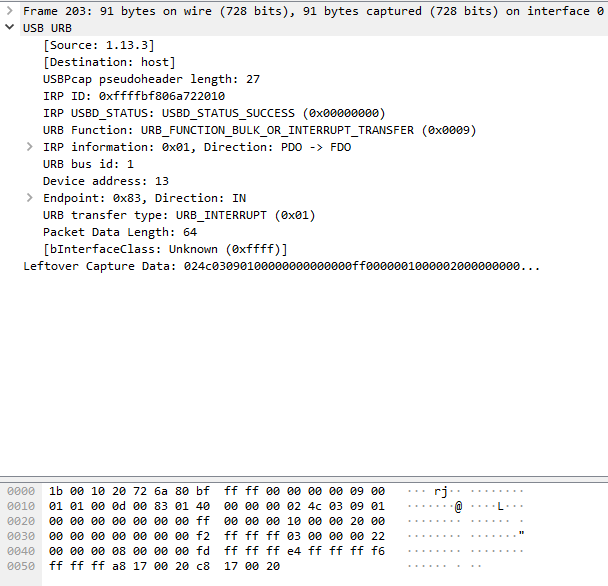 a default tool is available which triggers a callibration command, I sniffed these packets with Wireshark, but the structure of the OUT interrupt calls of the callibration tool differs from the LibUSB generated one, thus (I think) causing the command to not be executed. The documentation provides one of the following commands, which should run a diagnostics check that returns 5 bytes of data. D-1: either 0x01: Normal or 0x00 Error D-2: either 0x00: Normal or not 0x00, linked error code. I tried both async as synchronous implementations for the LibUSB library. The control transfer I tried randomly switching the variables after the most logical ways of filling them had ran out, without success, as to be expected. Since the results found in the packet sniffing clearly indicated INTERRUPT calls being made. Interfaces: The hardware has two interfaces. Interface 0 which contains OUT 0x02 and IN 0x81, and interface 1 which contains OUT 0x04 and IN 0x83. 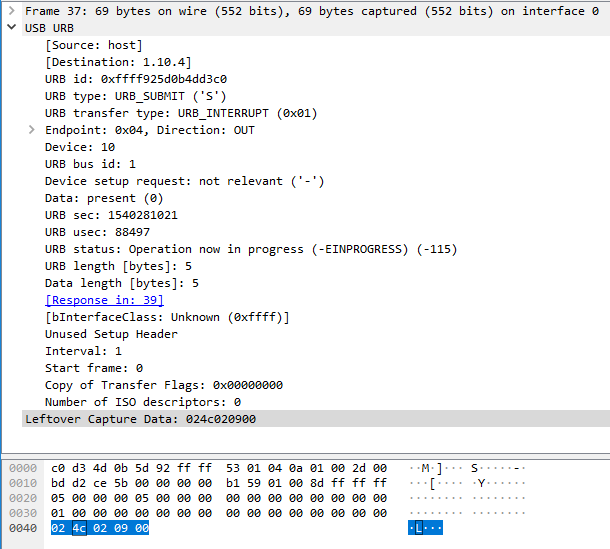 The sniffing of the USB interrupt call to the device triggered by the tooling provided that interface 1 is being used for the diagnostics command. (Also tried interface 0 with both IN and OUT, couldn't get it to work. 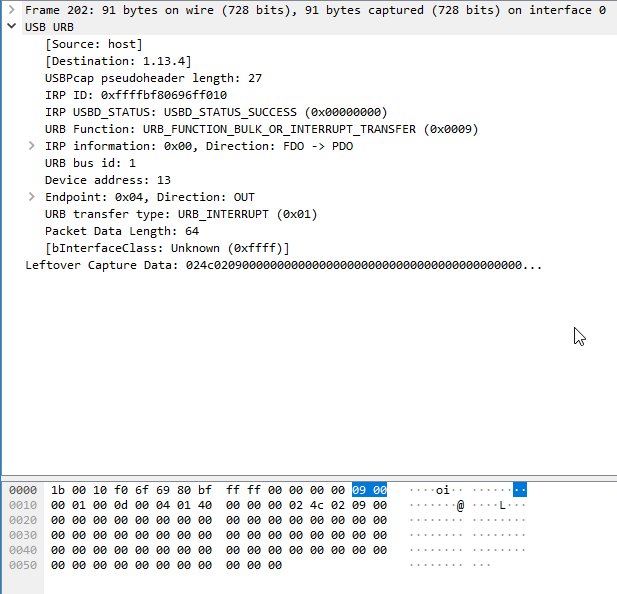 Results of the packet sniffing Request and response generated with the tooling: IMG: Interrupt OUT (I marked the bit where to command is actually provided) IMG: Interrupt IN response This code actually works and returns the, expected, dataset in its data slot. (as described above, the return format is correct, 0x01 and 0x00). Yes, I also tried setting the buffer to a size of 64, the max buffer size for the hardware. Sadly didn't work. As seen clearly, both requests differ a lot, do I use the wrong transfer method? Is it another supported format in which you can send commands? Used Code snippet: The code snippet is a bit outdated, I tried re-writing / editing it several times, the last implementations being used from online examples. I hope I that there's someone out there capable and willing to help me out here, because I've been working on this for three days straight and still haven't gotten a logical solution to this problem. Thanks for your response! I currently found a solution to the problem! It had nothing to do with using both C / C++. Sorry for the code being a bit messy. I wrote it several times so tidiness wasn't my priority, though I will keep it in mind for a possible future post on StackOverflow. Even though solved I added results of sniffing both packets going IN and OUT, hoping it may help others with a possible same issue. Well, what was the problem? So, the capture of the tool indicated the last 64 bit being the payload of the request and its data, this is for both OUT and IN. (As to be seen in the images now actually provided) and as I said before, I tried allocating arrays with a size of 64 and setting the first few slots with the data necessary for the operation. As for the other slots, they were filled with the leftovers sitting at those allocated memory addresses. // Initialize array of 64 bytes. I tidied up the code a bit to provide better readability, here is the code I used which works! Hopefully others find this information useful. qDebug() << "||" << r << "||"<< actual_written << "||"
qDebug() << actual_received << "||" <<feedback << "||"
// Further code should go here. Thomas and David, thanks a lot! I tried to do a statistic for business in my mini project. But I don't know how to calculate the total of money in the files after I adding a data. I thought that both of a and b would be decreased by one and then "2 11" printed but only a was decreased and the "2 12" was printed! After changing OR to AND , it works properly and "2 11" was printed . Why this happens ? I tried this on many devices but the result was the same . As shown in my following code. I have a function to create a socket in my server application. My code compiles fine and all; however, the function (named createSocket) will not finish. Hence, my program is stuck waiting forever when I run my program. I know this because, the fprinf function which is the next statement after my createSocket function never prints out. I've added a printf statement as my last statement of my createSocket function. And it does print! But it doesn't return to the caller (which is main). After compiling with gcc, and passing in 65000 as an argument to my program. The results are, only "william" printed out on the console, and then I am kept waiting (the program is still running). We have been tasked to write a test application for a raspberry pi IOT device running Raspian, one of the requirements for the application is to determine if the USB hub connected to the pi is working correctly due to the fact our supplier had to modify the pi by unsoldering and resoldering a connection to the pi for the USB hub. Via Debian Linux CLI command, or via node (test app currently running in Node on the pi), what could we use to let us know if or when something/anything USB has been plugged into the USB ports and possibly which port was used. I am trying to develop a system wherein I need to save data directly to an Android smartphone connected through USB from a Windows desktop app written in C++. Since I'm targeting old Windows versions such as XP, I want to make the application as stand-alone as possible, that's why I'm not using .NET. I have searched Microsoft's docs and it doesn't seem to contain what I want. The closest that I've seen is How to Access a USB Device by Using WinUSB Functions, but that still doesn't contain what I'm looking for. So, given the absence of official docs, is it even possible? I would like to connect to the mouse or ADNS2620 Mouse Sensor Evaluation Board via the Libusb library in Python. I made the necessary connections in the following code (which was previously published in stackoverflow). But to me ("raise USBError(errmsg, ret) usb.core.USBError: [Errno None] libusb0-dll:err [control_msg] sending control message failed, win error: A device attached to the system is not functioning. ") gives error and interrupts the connection between the mouse and the computer. How do you suggest a way to overcome this error? Second, how can I access the pixels received from the optical reader with the mouse sensor? I need to diconnect the USB connection from software execution (equivalent to unplug the cable). I will like to find a C++ command. Id this possible in any way? I have an attached device that is dissable if senses a USB cable connection. I need to dissable the USB but just removing the cable is not an option. 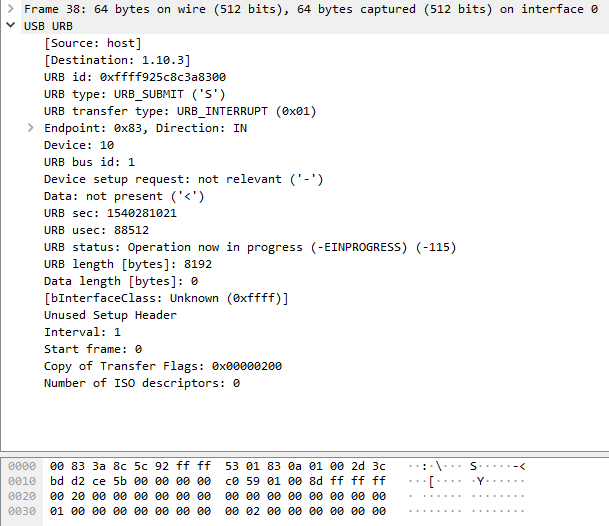 I am trying libusb hotplug support to detect usb devices. I took the sample program from libusb documentation. I trust this code as it provided in libusb documentation. when compiling, I am getting following error. I want to utilize what thrift provides, neutral language support, serialization, etc. but implement and integrate a USB-based transportation for bulk data transfer. libusb should have provided most abstraction on top of usb for me, and theoretically everything in linux is a file and can be connected via socket, so I don't see why it's impossible, but I'm not able to find any relevant resources, so I'm asking here. Any thrift experts could help? * need to detach it. normally I should receive "received by Arduino: hello world!!!!"